It was on December 9th in 1907 that the Aero Club of New England was formally chartered by the Commonwealth of Massachusetts. But aviation annals reveal that the history of the organization predates that historic occasion by five years, when it was organized on January 2, 1902, nearly two full years before the Wright brothers made their landmark flight of December 17, 1903 at Kill Devil Hill, North Carolina. "To advance the development of the science of aeronautics and kindred sciences." "To encourage and organize aerial navigation, excursions, conferences, expositions and races." "To hold, maintain and conduct games, meets, contests, exhibitions and shows of balloons or other inventions or constructions designed to be propelled or travel through the air." 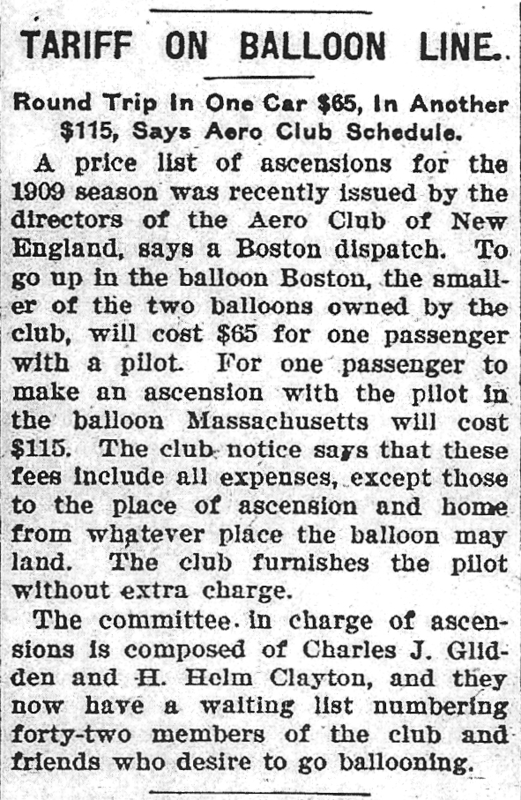 The club purchased a balloon of 35,000 cubic foot capacity shortly after its founding, named appropriately enough "Boston", and maintained one of the same capacity until 1915. For a time, the club also owned the "Massachusetts" of 65,000 cubic foot capacity. 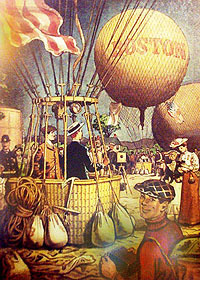 The Aero Club so aroused the interest of New Englanders in the daring sport of ballooning that for a number of years more ascensions were made annually in Massachusetts under its auspices than were credited to all the other states combined! The club was a leading participant in the first Harvard Boston Aero Meet held in September of 1910. Nationwide enthusiasm was mustered for this event, and competitors were attracted from abroad. Among these was a young Englishman, A.V. Roe, who later was knighted as the first Englishman to design, build and fly an airplane. He is perhaps best known for his construction of the AVRO bombers which did such effective work during World War II. Aero Club of New England members have always been justifiably proud of contributions to aviation by one of our early presidents, Dr. Godfrey L. Cabot. An early member of the club, Dr. Cabot served as its president from 1915 to 1929. He was the first American president of the Federation Aeronautique Internationale serving from 1941 to 1946. From the days of the Wright brothers, he was one of those forward thinking individuals who saw the potential value of the airplane in warfare. It was through his efforts, and under his leadership, that in 1916, the Aero Club of New England had the great honor to present to the Commonwealth of Massachusetts her very first aircraft, a hydro aeroplane, built at Marblehead by Burgess Co. and Curtis. Dr. Cabot, who was a friend of the Wrights, learned to fly a plane in 1915 at the age of 54 and soon became the proud possessor of his own aircraft. He won a commission as Ensign in the United States Navy and served in the Naval Anti Submarine patrol along the Atlantic coast during World War I. His name is honored and perpetuated by the Godfrey L. Cabot Award, established by the Aero Club in 1952 and presented each year to an individual selected for outstanding contribution to the development of aviation. Professor Abbot Lawrence Rotch of Harvard, seated, first row, fourth from the left. Prof. Rotch served as the Club’s first president (1902-03). Prof. Rotch, who trained as a meteorologist at MIT, was a founder of the Blue Hills Observatory, where many of New England’s early weather records were established. 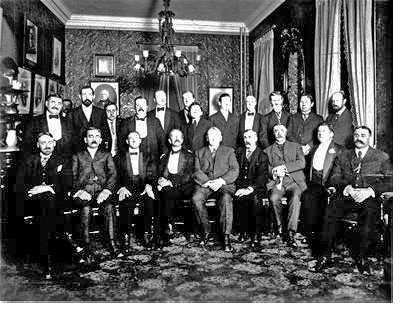 Discovered in the Print Department of the Boston Public Library by 2006 Massachusetts Aviation Historical Society president and club member, Bill Deane, this photo depicts 21 very serious members of the Aero Club of New England, at Young’s Hotel on Court Street in Boston on November 21, 1907. The purpose of this meeting was to commemorate the club’s official incorporation. The date also marked the 124th anniversary of the first ascent of a balloon in Paris by Pilatre de Rozier and the Marquis d’Arlandes in a balloon designed and built by the Montgolfier brothers. Another notable at the gathering was Charles J. Glidden, standing fourth from the left. It was Glidden who had organized and chaired the first meeting in 1902. Glidden had been described as “a leading spirit in both automobiling and flying” and founded the nationally famous Glidden Automobile Tours. He served as ACONE's second president (1903-07). Speaking of automobiles, the bearded gentleman standing third from the right was Francis E. Stanley, twin brother of Freelan O. Stanley. The brothers had migrated from Kingfield, Maine to Newton, Massachusetts, where they set up shop as promoters and developers the famed “Stanley Steamer." The glass-plate photograph, taken by the noted photographer Purdy of Boston, was published in the Boston Evening Traveler.